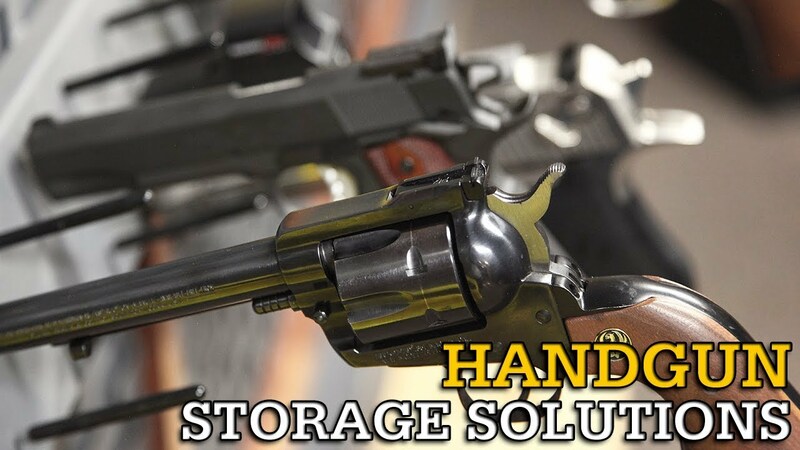 With so many different types of handguns in the market, gun owners can choose from a variety of storage options. However, finding the best option to store your handgun has now become an inundating task. While there are many serviceable lockboxes available to consumers, they don’t go above and beyond single handgun storage. Gun owners with smaller firearm collections and associated gear are left with having to buy something oversized or a number of these tiny handgun safes. With a Fast Box hidden gun safe, handgun owners can efficiently store a number of pistols or revolvers along with associated ammunition and gear. The Fast Box system can be installed in two ways, horizontally or vertically. In a horizontal application, the neoprene pad (standard with all Fast Boxes) adds a level of protection to the firearms and valuables you choose to store. When storing your Fast Box vertically, incorporating a series of Pistol Pegs and Storage Bins allow you to maintain fast access to the handguns and gear you want without sacrificing any level of safety or security. By decentralizing your handgun storage, you give yourself the tactical advantage over home intruders. You can securely store defensive firearms around the home for fast access in the event of an emergency situation. Some of the more accessible locations in your home are also the best place to secure a firearm to achieve this advantage. The benefit to the Fast Box is that it is secure, easily hidden, and easily accessible. A Fast Box conveniently hides under your bed, in a front hall closet, kitchen pantry, and even your vehicle. With a Medium Storage Bin, you can store smaller caliber handguns along with magazines and ammunition. Each bin has a storage capacity of 15lbs and comes with a polymer divider. Dividers allow you to store multiple pistols in one bin while not having to worry about your guns becoming damaged from bumping into one another. The bins are also a great method of keeping associated handgun parts together and organized. Adding a Single Pistol Peg to your Fast Box is a convenient way to incorporate handguns into your rifle storage or build a decked out handgun storage system. These individual handgun pegs store a caliber of 9mm or larger. They hang from a single louver and can adjust on the fly. Each peg also comes with a rubber protective coating to protect the barrel of your revolver or pistol. Click the links to shop Handgun Accessories and Storage Bins. Visit the Fast Box product page to shop and learn more today! I’m planning on getting a handgun of some sort. It makes sense that I would want to have a storage system for it! That way I can ensure that it doesn’t get into the wrong hands.